- This underdress is from Kievian Rus – in the area of present day Ukraine, and is seen in period paintings as well as one 17th century museum piece. - And seen in pictures of the Daughters of Yaroslav the Wise. 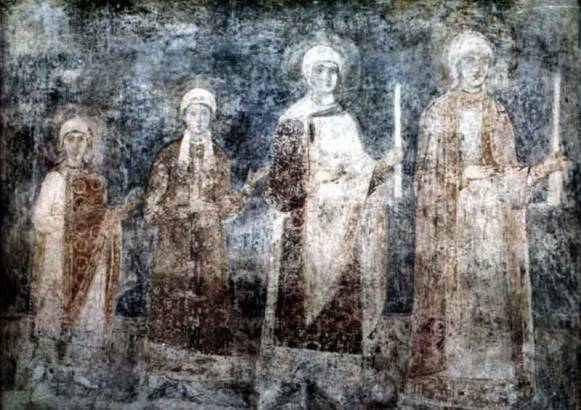 There are two pictures of the daughters of Yaroslav the Wise one from a 1651 manuscript that details a wall painting that was later painted over (See the picture in the Russian Historical Costume, pg 8, 44, 45) and the second from a restoration of the original 11th century painting found on Wikipedia. - Under dresses would have been worn by the general populous and embroidered at all openings with red thread. 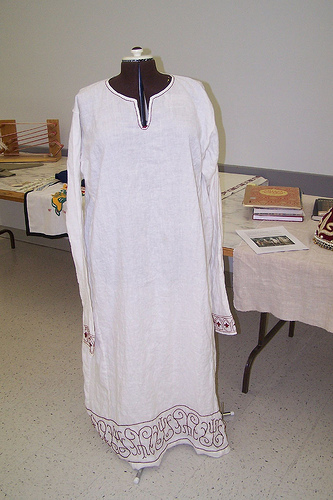 - The raw materials that would have been used to make the dress would be raw linen, and white linen or coloured silk for the rich (History of Ukrainian Costume, pg 16, 17, and 25). - A running stitch was used to join the pieces, and a French seam was used to make it more durable. The decorative embroidery stitches used were a wrapped chain stitch, satin stitch, and couching. - The pattern for the embroidery was taken from the picture of the 17th century men’s rubka (Russian Embroidery and Lace, plate 29) and historical Kievian embroidery (Elegant Kiev Rus, pg 28-29). - Next time I would make a similar piece out of silk and use more embellishment. Putsko, Vasyl, “Elegant Kiev Rus”, The Ukrainian Canadian 751 (245): 28-29, Kobzar Publishing, 1991.